My backordered games finally got flushed to my doorstep. 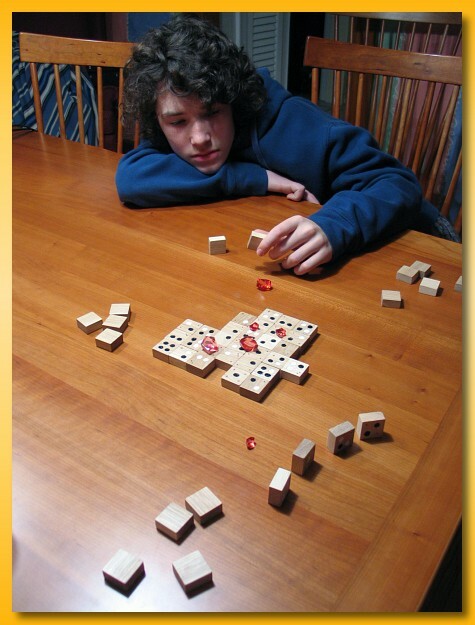 I’m keeping Hansa Teutonica, Dice Town, Dixit, and Ra – The Dice Game. 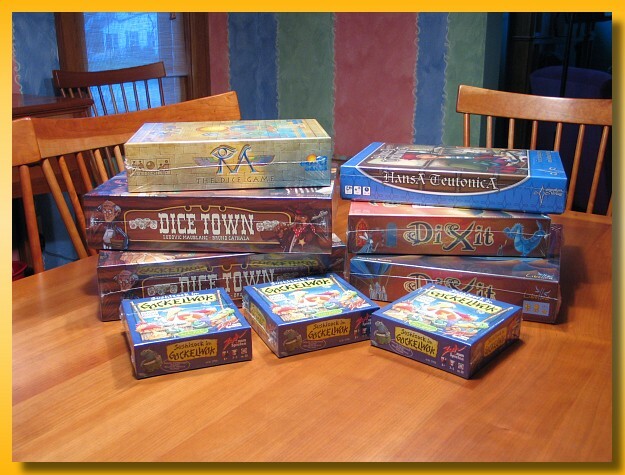 The other copies of Dicetown and Dixit as well as the three copies of Sushi are for friends. Following in the footsteps of the successful deployment of a multi-language and sanctioned implementation of Ingenious, I’ve recently been in a dialog with the marketing department at Sophisticated Games concerning an online implementation of Reiner Knizia’s Callisto. I’ve recently finalized the details of the commissioned work and would like to announce the effort. I’m excited to bring this game to the online “try before you buy” community and hope you enjoy the game as much as I do. I’ll be posting updates over the course of the next several weeks and as the design and implementation progresses I encourage your feedback. Also, if you’re interested in being a playtester for the online game, please feel free to drop me an email and maybe we can work something out. 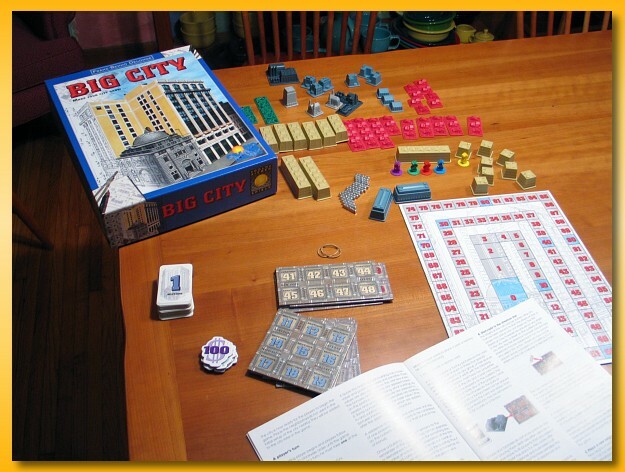 I’ve wanted a copy of Big City for years but was not willing to pay the premium prices for the out of print (OOP) game. Valley Games announced that they were printing another version but that was well over a year ago and I was getting tired of waiting. As luck would have it, I saw a “Like New” copy go up in the BGG marketplace for only $30 so after exchanging some emails with the owner I jumped at the chance. The copy arrived today and it looks freshly punched and the rules feel like they’ve never been opened. I inventoried the bits tonight and got started on learning the rules. This time, at least, it paid off to wait for the right moment to jump. Whipped up a homemade wooden (white oak) copy of Micropul today. It didn’t turn out as nice as I’d hoped (I rushed) but it is playable. I think I’ll take another shot at using some of the print and play designs for another attempt. Sophie, Noah, and I played Long Shot this morning. From the image, it looks like my 3 horse was doing pretty well but unfortunately we were battling for third place. Sophie cleaned our clocks by owning the 1 horse; it came in first, and she had $20 bet on it. My 9 horse came in second and Noah’s 6 horse third. We had a good time playing. Lots of laughs and grumbles at the good and the bad dice rolls. Long Shot is a relatively chaotic experience but it’s still proving to be lots of fun for us. 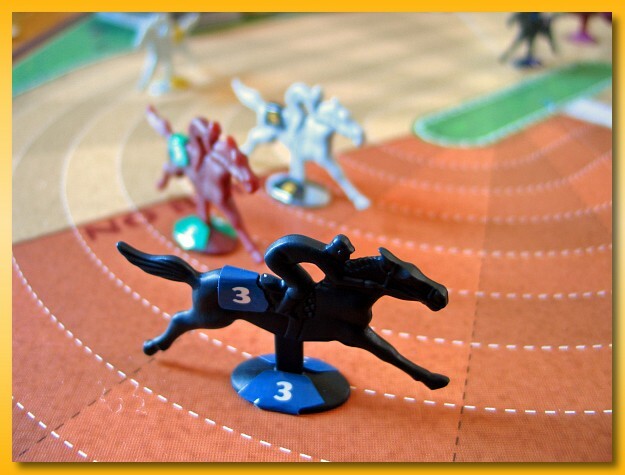 Author mattPosted on March 6, 2010 January 27, 2016 Categories All Posts, Board GamesLeave a comment on Come On 3!